Around My French Table in Oregon! I finished this week with my last meal from the Cook to Books Challenge from Around My French Table by Dorie Greenspan. 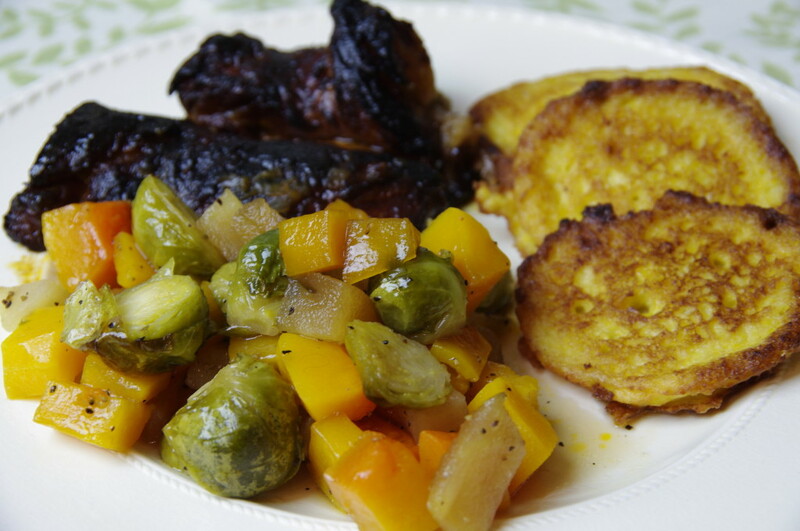 I made the Short Ribs in Red Wine, Corn Pancakes and Brown-sugar Squash and Brussels Sprouts. I enjoyed taking my family on a trip to France through my cooking from this great cookbook. Everything I made was a combination of fresh flavors and so easy with all the things I could buy Fresh From Oregon to make everything. 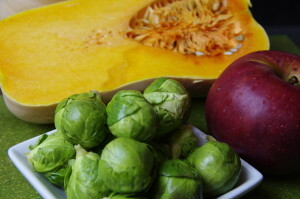 I especially enjoyed the Brown Sugar Squash and Brussels Sprouts and ask my mom, I do NOT like Brussels sprouts. But I made this dish and yes mom, I ate the Brussels Sprouts and did not need two glasses of milk to get them down. When I read this recipe so many other combinations of fresh vegetables and fruit came to mind that I can do throughout the year as different things come into season. I was very lucky that Brussels Sprouts are in season now in Oregon and got some last week at the Portland Farmers Winter Market. 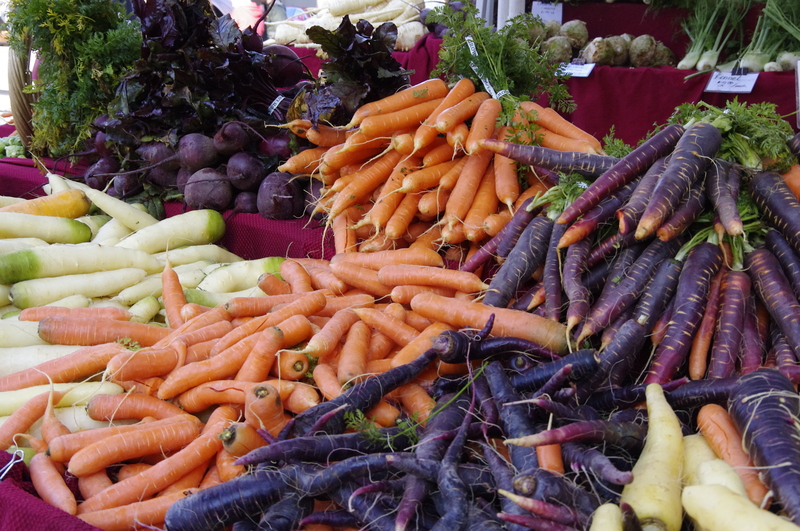 Here is how you can make your own bundle of sweet vegetables Fresh From Oregon. 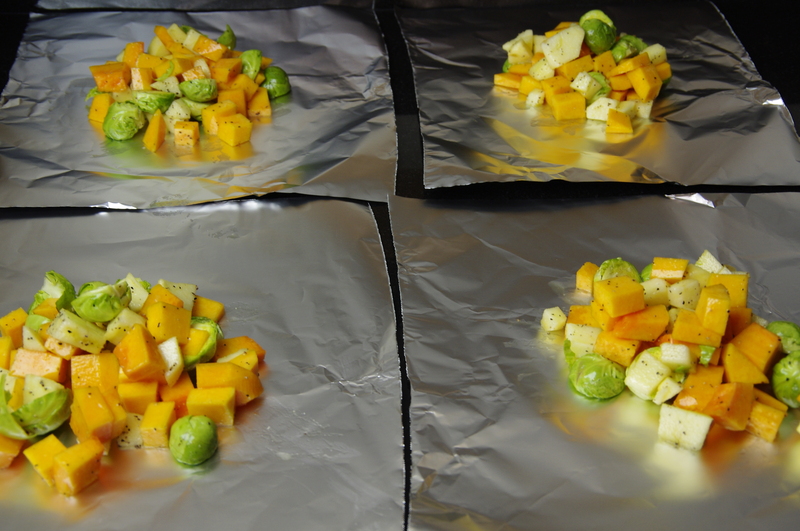 Preheat oven to 400 degrees and cut four squares of foil about 12″ x 12″. 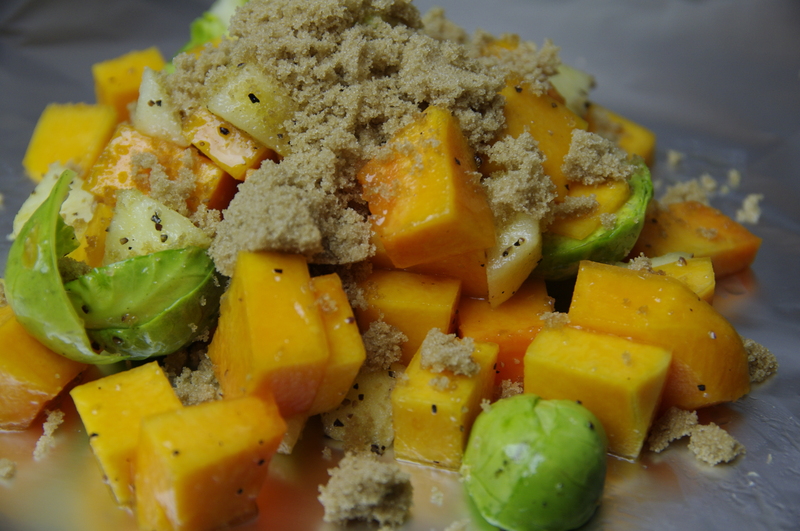 In large bowl combine 1 pound of butternut squash that has been peeled and cubed with 16 small Brussels Sprouts that have been cut in half. Add 1 apple (I used a sweet one) that has been peeled and diced. 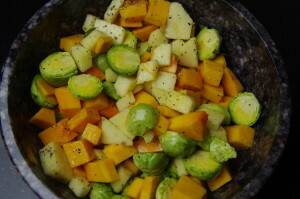 Toss with 4 teaspoons of olive oil, salt and pepper to taste. 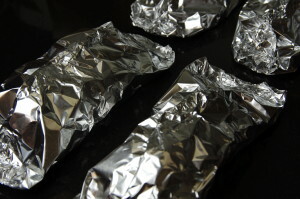 Divide the mixture between the four pieces of foil and top each with a teaspoon of brown sugar, I used a heaping teaspoon of brown sugar. The original recipe calls for a fresh piece of sage on top of the brown sugar but since my sage plants were covered with snow I skipped adding one. Draw up the edges of the foil and seal making a little package. 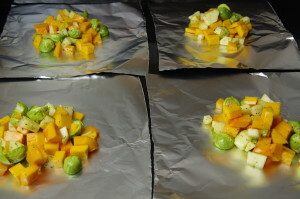 Place on baking sheet and cook for 25 minutes or until vegetables are tender. I am already thinking that the orange, yellow, white and purple carrots I also got at the winter market will be my next combination with some fresh thyme! looks awesome! i’m glad you’re playing along and using local ingredients. living in the NW too, (Seattle! ), i found a lot of recipes in this book that were perfect for what we can get our hands on out here. especially salmon! we’re gonna keep trying to do that, as we both have big gardens and i love hitting the farmer’s markets too. we’ve got a year round one in my nabe, fortunately!